Aircraft Performance - Can Your Aircraft Take The Heat? How does temperature affect aircraft performance? Back in January, we shared some helpful tips for flying in cold weather. 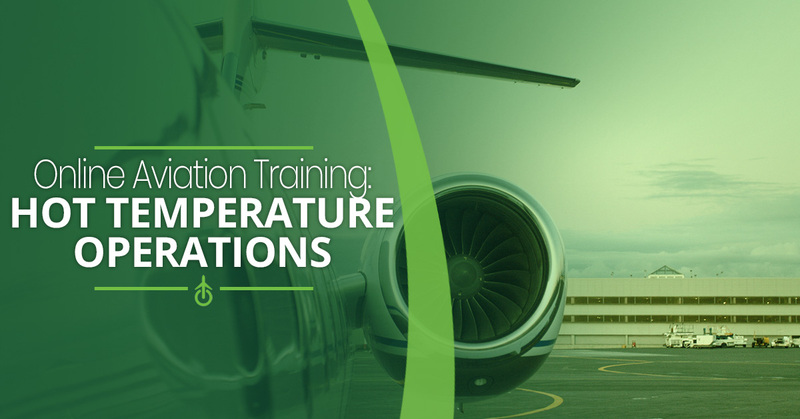 Today, in the heat of July, we are excited to share with you some information on our hot temperature online aviation training courses and tips for performing hot temperature operations. Let’s dive in. First, let’s start off with a fun fact. Airplanes perform better in cold weather conditions vs. hot conditions due to the density of the air. Cold air is more dense, which makes it easier for airplanes to lift off the ground compared to hot air, which is less dense, making it more difficult for an airplane to lift. On top of engines having to work harder to keep the plane in flight, extreme heat puts a lot of stress on an airplane that can cause flight issues, such as, seals melting or brake equipment overheating. It’s inevitable as a pilot that you will fly in scorching hot weather conditions. Thus, it’s important to understand how temperature affects aircraft performance and how you need to account for its effects for the safety of your passengers. Ultimately, the effects of aircraft performance in hot temperatures have the most impact on take-off and landing. Take off, the initial climb, final approach, and landing are the most critical times in a flight and heat adds an extra element of difficulty. As mentioned above, the air density is much lower in hot conditions, which causes the engine to have to work particularly hard to get enough lift to take off and gain altitude. Therefore, a longer runway is needed to both take off and land. To ensure a safe and successful flight during hot weather conditions, it is important to understand how high heat will impact taking off and landing and how you need to adjust your take-off and landing approach. On a basic level, the power of your engine is drastically reduced in high heat and low air density, making it less aerodynamic and more difficult to lift off. So, what do you need to do to make up for the lower engine power and performance? In high heat, the amount of weight an aircraft can carry is reduced. Unfortunately, this means some passengers may need to get booted off the flight. Due to the fact that your engine is working overtime and not producing as much energy, it’s essential that you make up for the lost energy by increasing your take-off distance and using the momentum gained to assist you in your initial climb. In low air density and hot conditions, higher speeds will help you produce enough lift to take-off safely. Less weight and longer runways will help you achieve a sufficient speed for take-off. Learn more about the influence of high temperatures on an aircraft’s performance and how it affects passenger comfort through our hot temperatures operation online aviation training course. We look forward to helping you maximize your training and improving your hot temperature operation skills.